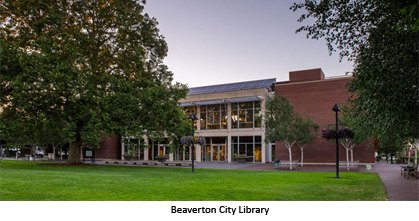 The Beaverton City Library in Beaverton, Oregon, needed a controls upgrade because their older proprietary C-Bus unitary controllers were failing. 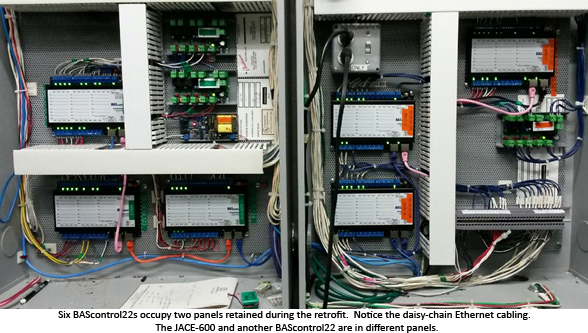 The existing JACE-600 NiagaraAX head-end with its support for BACnet and LON was to be retained, but all the C-Bus unitary controllers needed to be replaced. The goal was to not only replace failing equipment, but also to modernize the system to be completely BACnet compliant. BACnet is an open protocol that is very popular. Because of its popularity, it is supported by numerous vendors across product lines. That makes system integration easier and it gives the building owner the advantage of being able to choose between different systems. The Beaverton City Library, the second busiest library in the state, serves a population of approximately 142,000. Each month over 84,000 people visit the library to check out nearly 300,000 items. The total annual circulation exceeds 3.3 million items. The main library, located at 5th St. and Hall Blvd., is a 69,000 sq.-ft. full-service library maintaining a collection of over 350,000 items, has meeting rooms, a computer lab and youth programs. To meet the need for BACnet compliance, Contemporary Controls’ BAScontrol series of BACnet/IP Sedona controllers were used to replace the non-BACnet compliant controllers. Introducing BACnet/IP connectivity at the controller level allowed remote access to both the head-end and the unitary controllers. The library’s unitary controllers, along with some defective sensors and actuators, were replaced with seven BAScontrol22 controllers. BAScontrol22s now control a variable-air-volume AHU, a constant-air-volume AHU, a multizone AHU, two fan coils serving the boiler and chiller rooms, and two unit heaters in the mechanical room and associated chiller pumps. The two Aerco boilers had local controls but a BAScontrol22 provided lead/lag coordination and supervision. The BAScontrol22 is a BACnet/IP B-ASC compliant controller that can be programmed using the open control language called Sedona where components are dragged and dropped onto a wire sheet to create applications. The BAScontrol22 has eight universal inputs, four binary inputs, four analog outputs and six binary outputs – enough I/O to accommodate each application at the library without I/O expansion. There are two Ethernet ports on the controller allowing for daisy-chain network connectivity to the JACE-600 head-end over Ethernet. Points integration was over BACnet. Since this was a retrofit project, the City of Beaverton put out the bid documents with contractor American Heating of Portland OR becoming the successful bidder. American Heating sub-contracted DDC Support Services to provide control drawings, points-lists, and all the Sedona and Niagara programming. DDC Support Services also assisted with startup commissioning. "The BAScontrol22 demonstrated its versatility in that it could accommodate a wide variety of applications including AHU-VAV, AHU-CV, AHU-multizone, boiler, chiller, cooling tower, fan coil and unit heater control with the same model controller," said Jon Vietti of DDC Support Services. "Sedona programming has the same look and feel as Niagara thereby simplifying control sequence programming." The future goal is to replace the existing LON VAV terminal units with BACnet units to make the complete system BACnet.